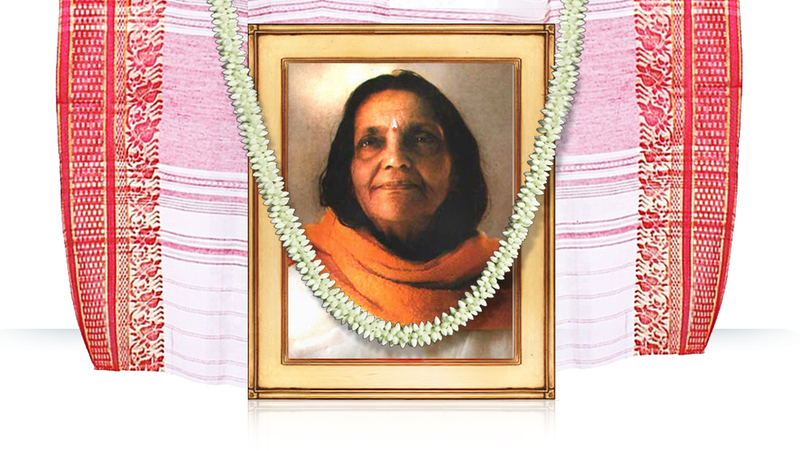 Sri Ma Anandamayi today is widely recognized as a personality of great spiritual eminence. She was born in 1896 and she took samadhi at the age of 86 ; these limitations, however, cannot said to have conditioned her utter freedom to be just herself under all circumstances. She was the embodiment of a joyous self-sufficiency, which enraptured the hearts of all who came near her. The mysterious aloofness of her personality was totally beyond human understanding and yet it was so tempered by her compassionate love for all living creatures that she seemed closer than the most indulgent friend ever could be. She was the Teacher whose guidance was sought by the learned as well as the simple, the old and also children, people from alien cultures or from traditional backgrounds. One visitor, an Irish journalist frankly asked her, “Am I right to believe that you are God?” Sri Ma answered, “There is nothing save He alone; everyone and everything is but a form of God. In your person also He has come here to give darshana”. He persisted, “Why are you in this world?” “In this world?” Sri Ma answered, “I am not anywhere. I am myself reposing within myself’. During the same conversation the Irishman said, “I am a Christian:’ Sri Ma answered, “So am I, a Christian, a Muslim, anything you like”. Richard Lannoy, a devotee of many years standing has summarised Sri Ma’s ways of being with us in a very telling phrase: “Yet there is a strangeness, a particularity, an indefinable quality which comes so near the limits of the definably human as to make an adjective like ‘human’ quite inadequate when applied to Her case, and ‘divine’ paltry. It is widely accepted that She was, simply, unique. She was, throughout Her life, the acme of effortless perfection”. 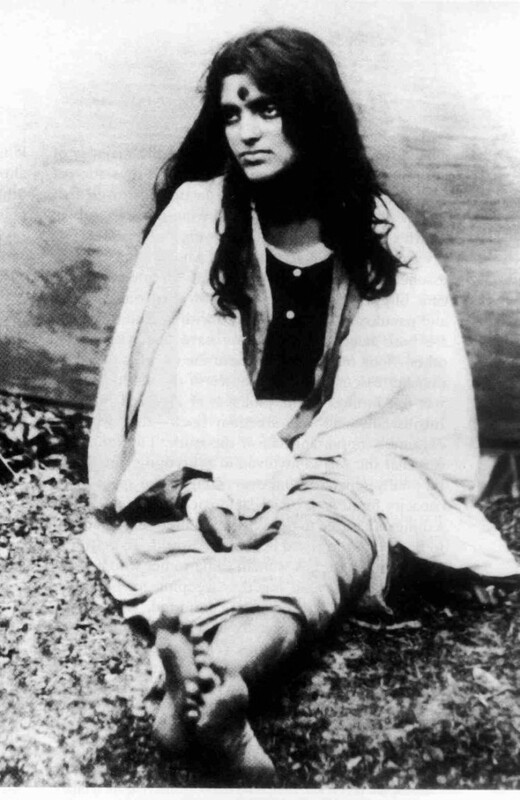 Sri Ma Anandamayi was born in a small village called Kheora, in what is now Bangladesh, on April 30, 1896. She was born into a pious, prestigious but non-affluent brahmin household. Her given name was Nirmala Sundari Devi. It is translated as ‘Immaculate Beauty’ which seemed appropriate as the infant grew up to be a lovely child. Sri Ma’s father was a devout Vaishnava. He was well known for his beautiful rendering of devotional songs; his melodious voice never failed to touch the hearts of his audience. In fact he was sometimes compared to Ramprasad, the saintly bard of Bengal who it is believed had invoked the presence of Shakti by his inspired singing. Sri Ma’s mother was a gentle woman of upright nature totally dedicated to the welfare of her family. That she was not just like countless such others became evident as the years went by. Many will remember her as the ochre-robed Swami Muktananda Giri who accompanied Sri Ma on her travels. 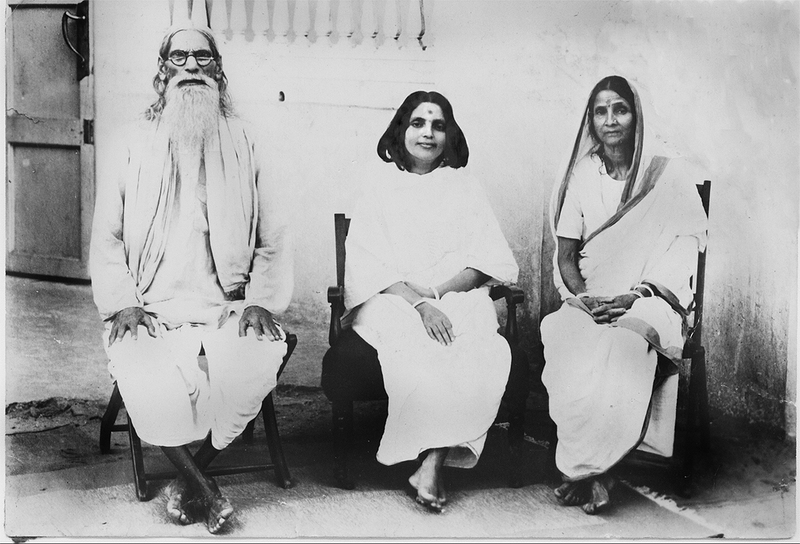 Sri Ma with her parents, Bipinbihari Bhattacharya and Mokshada Sundari Devi. 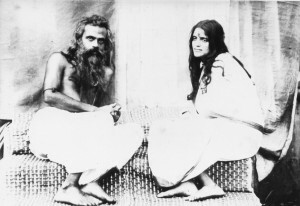 Sri Ma with her husband, Ramani Mohan Chakrabarti of Vikramapura, whom she would later rename Bholanath. Sri Ma was barely thirteen when she was married to Sri Ramani Mohan Chakravarty of Atpara. Their family had a tradition of Shakti-upasana. As a child-bride Sri Ma was received into the family of Ramani Mohan’s eldest brother Sri Revati Mohan and his wife Pramoda Devi. She remained with them for nearly four years while Ramani Mohan was in Atpara and in Dhaka. From a carefree childhood in her parents’ home she was catapulted into a demanding situation of considerable physical hard work in an atmosphere of restrictive discipline. She cooked, cleaned, fetched water, took care of the children and served her sister-in-law in every way possible. Hard work is the lot of village women not only in India but all over the world. What sets Sri Ma apart from all such girls placed in similar situations is the fact of her total adequacy and a little extra, as it were. She remained uniformly cheerful, good-humoured, and more than willing to shoulder other people’s burdens. Nothing was a chore to her. Her serene and equable temper was never disrupted by thoughtlessness or unfair treatment at the hands of the elders. Actually Sri Ma’s untroubled happy disposition caused her new family some anxiety; it could only mean a simple mind. In her childhood also she had invoked this fear in her parents’ thoughts – perhaps the little girl was just a little below par, not to be at all mischievous and naughty like other children? It took many years for Sri Ma’s close companions to realize that she was ever established in her often repeated Vani: jo ho jaye: ‘Whatever comes to pass, let it be’. It took time for discerning people to understand that Sri Ma was obedient but not biddable or suggestible. Her boundless compassion overflowed in concern for whoever came within the orbit of her ministrations: family, neighbours, servants as well as animals and plants felt the magic touch of this innate interest in their welfare. She also had a very ready and impish sense of humour which always took note of the foibles of her companions and gave her and perhaps a friend, much quiet enjoyment but being without malice she never made fun of anyone. She always had the aura of perfectibility all around her but somehow it never overwhelmed her companions. On the contrary; by her gentle ways and ready smile she endeared herself to everyone who came in touch with her. At the age of 18, Sri Ma by the mutual consent of both families came to Ashtagram to stay with her husband at his place of work. In later years Sri Ma used to refer to her husband by the name ‘Bholanath’ so we shall use this title for him in this account. At the time of her coming to Ashtagram her mother had told her that she should give the same respect and obedience to her husband as she had given to her father. It has been noted that throughout her life Sri Ma was very mindful of her mother’s gentle behests. Bholanathji met with a friendly but deferential treatment, which was very endearing. The mantle of a responsible guardian in charge of a precious treasure descended on his shoulders as it were. It may be stated at once that he wore this mantle with circumspection and competence all his life, till his death in 1938. Sri Ma always had the aura of perfectibility all around her but somehow it never overwhelmed her companions. On the contrary; by her gentle ways and ready smile she endeared herself to everyone who came in touch with her. Much has been written regarding the purity and perfect celibacy of Sri Ma and Bholanathji’s married life. These words are rather inadequate because it would be much better to say that such questions never arose where they were concerned. Bholanathji obviously bore the impact of a beautiful young wife who was ready to obey his slightest bidding with an exemplary calmness of spirit. Their neighbours and close friends do not report that he was not perfectly contented as he was. Bajitpur: From Ashtagram, Bholanathji came to Bajitpur on a transfer. The township of Bajitpur has acquired special significance for the devotees of Sri Ma as the place where she went through the various processes of intensive sadhana. How this came about may be best related in her own words; “One day in Bajitpur I had as usual gone to the pond near the house where we lived, for my daily bath. While pouring the water over my head, the kheyala came to me, ‘how would it be to play the role of a Sadhaka? And so the lila began” These two words used so constantly with reference to Sri Ma, perhaps need to be explained a little. Kheyala may be best explained by the words ‘a spontaneous thought’, distinct from an act of will or a wish for some desired end. It generally came into being perhaps taking shape out of the needs of her companions. Once expressed it was seen that a concatenation of events led to its fulfillment. Sometime kheyala could be invoked by repeated requests or deflected also. Sri Ma seemed equally agreeable toward any of the results accruing from her kheya1a. Lila could be translated as “sportive play” -an activity, which is an end in itself. With Sri Ma, Kheyala was simultaneous with spontaneous action in relation to it. In the evening she again swept out her room and its precincts. She lit incense and made a circumambulation round the cottage with the burner in her hand. She took care of Bholanathji’s needs on his return from work. Even to the detail of preparing a hookka for his after-dinner smoke. After Bholanathji had settled down, she asked his permission to engage in a little sadhana. This, he readily granted. So Sri Ma sat on the floor in a corner of their room and orally began to repeat the word ‘Hari, Hari, Hari’…, for no better reason than that she had learnt to sing this Name from her father in her childhood. Bholanathji saw her becoming gradually absorbed in a world of inner joy. After a few days of this routine, he saw her assuming some yogic postures or asanas. The first of these was probably the siddhasana. Bholanathji knew of course that she had no previous knowledge of Yoga or Yogic asanas; they were happening to her. He said one day,”Why do you say ‘Hari’? We are not Vaishnavas”. Sri Ma asked, “Shall I then say Siva, Siva?” Bholanathji was satisfied. The change of Name had no effect on the kriyas of sadhana. Sri Ma has said that she contemplated no visual forms when she repeated the words. The sound was all in all. The syllables were like the resonance being struck off an all-pervasive beat. Her body was as if in tune with the universal rhythmn of that power, which underpins all that exists. Her body became as if an instrument for the play of this cosmic music. She seemed to become one with the sound of the letters that she uttered; her limbs, her entire body moved rhythmically as if in vibrant dance-forms of an extra-ordinary choreography directed by an inner Power. Sometimes she lay for many hours absolutely still and totally absorbed in an inner bliss. At such times her body emanated a radiance which was visible to onlookers, Bholanathji watched her enthralled never doubting the genuineness of the manifestations; he was able to brush aside adverse comments from some of the neighbours who failed to understand that they were witnessing the unfolding of the magnetic personality of Sri Ma who had the kheyala to reveal herself in the role of a sadhaka. Sri Ma lived the life of a pilgrim on the path of spiritual endeavour for nearly six years; during this time she initiated herself and proceeded thereafter in a more systematic manner. Bholanathji realized that he was in the presence of a very special embodiment of Divine Power. He himself accepted the much-coveted initiation from Sri Ma within the first year of this manifestation. Thereafter their relationship acquired a new dimension – that of Guru and disciple, although Sri Ma never changed in her attitude of complete obedience and deference to Bholanathji’s wishes. Referring to this period of her life, Sri Ma has said, “Sadhanas by which man endeavours to attain self-realization are of endless variety, and each variety has innumerable aspects. All these revealed themselves to me as a part of myself”. In later years she had occasion to talk about her experiences in select gatherings of ascetics, scholars or other seekers of Truth. The pandits have marvelled at her knowledge of all tenets of faith, in all their doctrinal details. Sri Ma has said that even so she has not talked about one thousandth part of all that was revealed to her during her years of intensive sadhana. Sometime in 1922 she became maunam that is silent. This silence came as a mark of the fulfillment of sadhana. After the period of maunam, she began to converse with visitors on religious topics. From Bajitpur Sri Ma and Bholanath came to Dhaka on April 10, 1924. Bholanath became the Manager of the Shahbagh Gardens, a part of the Estates of the Nawabzadi Pyari Bano. Many of the people who had known them in Ashtagram and Bajitpur had relations in Dhaka. The rumour gained ground that the young housewife in the Shahbagh Gardens was gifted with great spiritual powers. Visitors came out of curiosity and stayed to become life-long devotees. 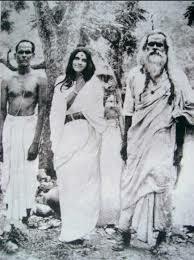 In accordance with the orthodox customs of those times Sri Ma kept herself veiled in public. If Bholanathji asked her to speak to anyone, she would do so but not otherwise. Women, of course, were always free to visit and soon there was a crowd round her. The men continued to be at a disadvantage because they were mindful of public opinion, but here Bholanathji played an important role. Soon he began to be looked up to as Baba Bholanath, a person commanding respect in his own right. Under his aegis, the swelling crowds assumed the shape of an ever increasing but close-knit family. Among the early devotees were Sri Jyotish Chandra Rai, who came to be known as Bhaiji in this circle; Sri Shashanka Mohan Mukherji (later Swami Akhandanandaji) and his daughter Adorini Devi, known to all devotees as Gurupriya Devi or Didi. Sri Nishikanta Mitra, Sri Pran Gopal Mukherjee, Sri Niranjan Rai, Sri Baaul Chandra Basak (Bholanathji’s life long friend) and many many others. Sri Ma’s parents were invited by Bholanath to come and stay at Shahbagh. They came to be known as Didima (Mother’s Mother) and Dadamashai (mother’s father). From them, the devotees of Dhaka heard about Sri Ma’s childhood days. Bholanathji’s sisters and brothers with their families also came together in Dhaka after many years. One sister remarked “After our father’s death we had become rather scattered; now Badhuthakurani (a term of endearment for a brother’s wife) is making it possible for us to come together as a family again”. Sri Ma moved in this manner with the kirtan party for a few moments. After such bhavas she would lie in a samadhi for many hours. It was always Bholanathji who decided when to try and rouse her. She had this kheyala of obeying him, so when he called her repeatedly, she would somehow open her eyes and say, “You want me to get up?” in lisping and slurred tones. At this time he would ask the women to rub her hands and feet gently and keep talking to her and make her answer some questions. In this way slowly Sri Ma would be drawn back to the ordinary world. Didi Gurupriya writes in wonder “It amazed me that Sri Ma so naturally entered into a state of God-intoxication, a state which is coveted by sadhakas of all time. No, not God-intoxication, her state could not be called that, I do not know how to describe a state which was at once sublime and yet normal”. This interplay of the dimensions of normalcy and transcendence was a constant and inalienable feature of Sri Ma’s behaviour. Sometimes it was likened to a sudden play of lightning in the skies. One description is, “It was like simultaneously experiencing sunlight and moonlight. Before one could be dazzled and overwhelmed by the rays of the sun, one would be soothed and reassured by the gentle moonbeams”. These states were frequent and visible to all at this time but they had happened in her childhood and while she was with Revati Mohan’s family as well. They had not been understood by her companions of those times and been dismissed as some mild kind of fits which would pass away as she grew older. Sri Ma’s overall deportment was so radiant and cheerful that it was easy to discount a few signs of sudden withdrawals into an inner world of mystery. The halcyon days of happy gatherings round Sri Ma were rather short lived. Sri Ma set out on her travels in 1927. Baba Bholanath liked to visit places of pilgrimage. They travelled quite extensively. The devotees of Dhaka gradually got accustomed to Sri Ma’s frequent absences. It became clear that Sri Ma had the kheyala to leave Dhaka. The devotees had built a small Ashram for her but Sri Ma’s kheya1a to move out proved too strong. Accompanied by Bholanath and Bhaiji Sri Ma left Dhaka on June 2, 1932. Travelling in a haphazard way she happened to arrive at Dehradun. From here they found their way to Raipur a remote village in the interior. They took up their abode in the dilapidated Siva Temple a little way from the village. This was the beginning of a new way of life for two of them. Bholanathji devoted himself to his sadhana wholeheartedly. Bhaiji tried his hand at rendering such services, which so far he had received from his own servants. To sweep and clean, wash clothes, cook primitive kind of food was hard work for him. Sometimes Sri Ma helped him out but in general she wandered around alone or sat surrounded by the village women. When she returned to Dehradun she and Bhaiji stayed at the Manohar Temple in Ananda Chowk. Bholanathji spent almost 3 years in Uttarkashi in doing his own tapasya; In Dehradun she came in touch with all the Kashmiri families who resided nearby. Sri Hari Ram Joshi became a devotee and a great admirer of Bhaiji. He was a man of strong convictions; moreover he had the courage of his convictions. Having given his allegiance to Sri Ma, he tried his best to bring all his friends to her feet. He was instrumental in introducing Smt. Kamala Nehru to Sri Ma. This proved to be a meeting which led to other ties being forged with other people from far and near. Smt. Kamala Nehru’s one-pointed devotion to Sri Ma was remarkable in its depth and strength. She carried her memories to Switzerland and so influenced some of her friends, that they came to India to see Sri Ma. Mahatma Gandhi came to know a lot about Sri Ma from Kamalaji. He was so impressed by all that he heard that he sent his trusted right-hand man Sri Jamnalal Bajaj to Sri Ma. He in his turn became so dedicated a devotee that Sri Ma had the kheyala to travel to Wardha after his unexpected death and so met Gandhiji himself. In later years Sri Jawaharlal Nehru and Indiraji came to Sri Ma drawn to her inevitably by their memories of the last days of Kamalaji. The Raja Sahab of Solon, met Sri Ma around this time. He became one of the foremost devotees and was known to all as Jogibhai. Dehra Dun became another Dhaka. The tradition of joyous gatherings spread to other towns such as Delhi, Meerut, Lucknow, Solon and Simla. At Simla the festival of Hari-kirtan under the aegis of the Hari Sabha received a new lease of life in Sri Ma’s presence and by Bholanathji’s enthusiastic participation. Bholanathji had rejoined Sri Ma on coming down from Uttarkashi. He had been introduced to the new devotees and accepted whole-heartedly as Pitaji (father). The swelling tides of the happy crowd unknown to themselves were facing two crises : Bhaiji passed away in Almora in August 1937 and Bholanathji himself left his sorrowing family of devotees in May 1938 in Kishenpur Ashram. The passing away of Bholanathji resulted in a new understanding of Sri Ma and her ways. Sri Ma had been a very devoted wife and she had tirelessly rendered personal service to him whenever he had been ill. During his last illness she was constantly at his bedside. He died with her hand on his head and breathing the word ananda. It was felt that he was giving expression to his own state of an ananda and peace. Most of the devotees had thought that Sri Ma would be distraught but they were amazed to see that there were no signs of grief. She remained as serene as always. She noted their reaction and said gently, “Do you start to wail and cry if a person goes to another room in the house? This death is inevitably connected with this life. In the sphere of Immortality, where is the question of death and loss? Nobody is lost to me”. Sri Ma’s followers began to understand a little of the meaning of her total detachment and yet an over-flowing compassion for her people. 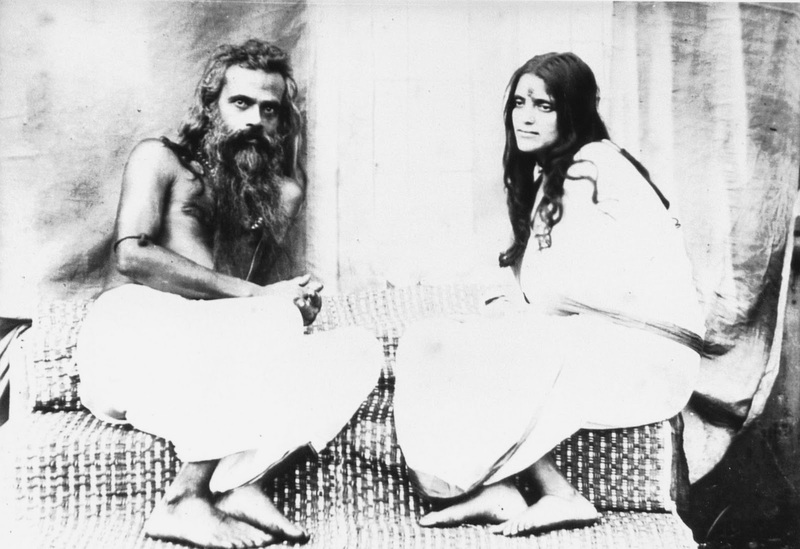 As the years passed the enigma of her personality deepened; from the very moment of her birth she had been fully self-conscious; she was not a sadhika, yet the stages of various sadhanas were revealed through her body and reached their culmination without her being engaged as a doer, in a very short time span. This might have taken aeons for an ordinary sadhak, even for a single path of sadhana. She was not a teacher yet people learned from her lucid explanations of various complex spiritual queries put forward even by erudite scholars and contemporary authorities on those subjects. 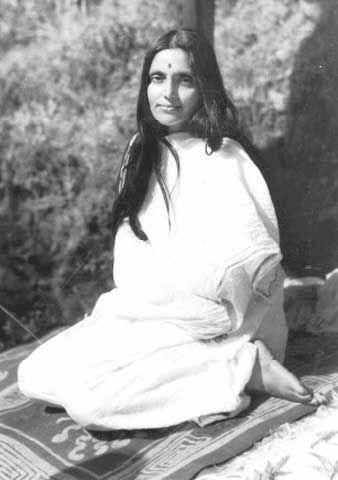 She seemed fully aware of all doctrinal differences, never confusing one with the other in her conversations with the learned pandits; yet she had not been initiated into any particular religious order or trained by any yogic instructor. She had not encountered any Guru who could have exerted any influence on her life. In fact she had never retired from the world to become a recluse, neither did she withdraw herself from her kith and kin. She had not performed sadhana as it is generally understood in the tradition, yet she could speak with authority on all aspects of the life of a religious quest for enlightenment. Such are the facts why the word ‘unique’ is applied for describing her. Sri Ma continued to move around in her own style of unstructured itineraries but she did not always choose her companions. It was a motley crowd which surrounded her. Many times it so happened that many in her entourage did not speak the same language. People from different provinces, different walks of life, mingled together in happy throngs. It was experienced that Sri Ma would accept invitations for religious functions. So the devotees would arrange for Bhagavat Saptah, Durga Puja, Chandipath etc. in their towns. They would pray for her presence at these functions. Wherever Sri Ma stayed, it immediately became the centre for a gathering of thousands. Sri Ma in her compassionate regard for the organisers moved out as soon as things began to get out of hand. There was no central management in Sri Ma’s vicinity; whoever was able, took charge for as long as he could. Matters arranged themselves as it were. It is difficult to describe the sheer impromptu nature of management, which took place near Sri Ma. Unless one has experienced it for oneself, it is not possible to credit the utter fortuitous nature of a concurrence of events which seemed to fulfil Sri Ma’s kheyala regarding her travels, companions or at times her places of retreat. In all the major cities, Sri Ma visited frequently, the devotees got together to construct one Ashram after another but it did not serve the purpose of restricting her movements or providing her with some comforts while she stayed in one place because as often as not she would not visit the Ashram at all but go some place else. In 1940 Sri Ma came in close touch with Sri Prabhu Dattaji Maharaj of Jhunsi, a Mahatma of considerable renown. 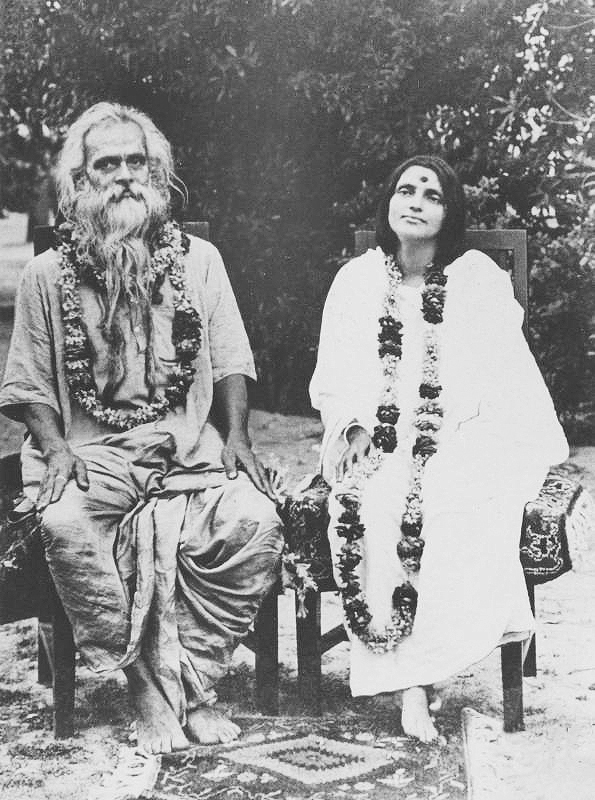 He invited her to join in their council of sadhus at Jhunsi in 1944. Here other Mahatmas came to know her, notably Sri Haribabaji Maharaj, Sri Chakrapaniji and Sri Sharananandaji. So far the Sadhu Samaj had avoided her because she happened to be in the form of a woman. Sri Prabhu Dattaji broke down this artificial barrier. Thereafter Haribabaji Maharaj gave her the highest honour possible. The heads of other Monastic Orders recognized in her the quintessence of the Upanishadic tradition and accepted her word as Shastra itself. At Sri Ma’s kheyala a great Savitri Yajna was started at Varanasi in the newly built Ashram on January 14, 1947. The samkalpa was for “The Good of Mankind”. There was great tension in the country just before Independence in August of the same year. Notwithstanding all these negative factors the Yajna proceeded unhindered and came to a spectacular conclusion on January 14, 1950. A great concourse of renowned Mahatmas graced the occasion. It was attended by princes, artists of repute, political personalities, and the ordinary mass of people. In Sri Ma’s presence all functions take on an extra-ordinary glamour. This yajna solemn and grand in itself was overwhelming in its impact on the participants. The most attractive function under Sri Ma’s aegis turned out to be the Samyam Saptah. Sri Ma very often spoke on the importance of observing restraints in one’s way of life at least once a month if not once a week. Sri Jogibhai, the President of the Sri Anandamayi Sangha suggested that a Saptah of samyam be arranged in Sri Ma’s vicinity so that all devotees could assemble for this purpose.The first such saptah was organised in Varanasi Ashram in 1952. The participants would observe total fast on the first and last days. In between a menu of very simple meals once a day was drawn up by Sri Ma herself. Under her guidance the programme for the whole day was sketched like this. After personal daily puja etc., all participants would gather in the Central Hall for listening to scriptural discourses, kirtans and meditation. Doors would be closed so that there would be no disturbances. After a short break during the afternoon for food and a little rest, the Vratis (participants) would assemble for the evening session and so on. The popularity of this function was phenomenal. The whole Ashram geared up to it. Mahatmas came from far and near. People heard learned lectures from orators whom they would never have had occasion to hear in the ordinary course. They heard rare scriptures and listened to good music. The best part of the day was at 9.30 P.M. when Sri Ma answered questions from the audience. The whole day passed by like a flash in looking forward to this half hour of matri satsang. The participants were amazed that they could live like ascetics for a week so effortlessly. The best way to understand Sri Ma is not to compare her with any of the luminaries in our spiritual skies. The recognition that she gained in her own lifetime was just by her presence. This is what Swami Chinmayananda said about her in Bangalore (June 1978) ‘When the sun shines nobody needs to demonstrate the sunshine’. The harmony of opposites was the underlying theme of her way of life. Amidst the splendour and magnificence which seemed inevitable wherever she was, she lived like an ascetic. Throughout her life she was a very small eater. Apart from the months of abstention from food, which happened periodically, she followed other rigourisms. For many years she used to eat on alternate days. When remonstrated with Sri Ma would say, “It is not necessary to eat at all to preserve the body. I eat only because a semblance of normal behaviour must be kept up so that you should not feel uncomfortable with me.” The intake of food was not related to any of her illnesses. Actually she was in perfect health when she was not eating anything. Illnesses came and went following a rhythm of their own. In her time she met with nearly all the political dignitaries who rose to power after Independence. They did not talk about state affairs with her. She only spoke about God and the religious asprirations of man. Some devotees in praise of her all-encompassing message sometimes say that she welcomed all faiths as true paths to God. This could be an understatement. The fact was that Sri Ma saw no differences which had to be cemented; to her, indeed,everything was the One only. The same may be said about her treatment of women. She recognised no inferiority or superiority. She demanded (if such a word can be used for her) the same high quality of asceticism from the brahmacharis as well as brahmacharinis of the Ashram. Purity of speech, action and thoughts was ever the ideal, which she set forth for all travellers on the path of God-realization. Sri Ma when speaking with modern young people, showed herself to be fully aware of the trends of the times; even so, her interlocutors could never make her accede to their demands for compromises. She with great humour and understanding could always bring them around to accepting her request to begin the search for Him who is hidden in the cave of the heart. In retrospect it now seems that Sri Ma started the process of withdrawing herself much ahead of time. She became increasingly unavailable because it was said she was not well. All her devotees know that illness happened to her because it was not her kheyala to deny them access to her. Many times she had said, “Why do you feel so antagonistic to illnesses? They also come to this body like you do. Do I tell you to go away?” Acceding to the prayers of her companions Sri Ma had been seen many times, also, to perform certain Yogic kriyas to get rid of her ailments. In the late seventies and in 1981 she did not have kheyala to respond to any kind of prayers for her recovery. She went about fulfilling her various engagements. She did not look ill but as beautiful and serene as ever; but definitely the mass of devotees got used to the idea of not getting her darshana as easily as always. For all practical purposes she had withdrawn herself from public audiences apart from a few exceptions. Her last kheyala seemed to have been for the performance of the ati Rudra Yajna at Kankhal. This was the greatest of the Vedic Yajnas. Under Sri Ma’s Guidance it was celebrated with such splendour and scrupulous adherence to every detail of scriptural injunctions that the Savants said Sri Ma had initiated the Satya Yuga in the fron Age of Kali. In the last days Sri Ma was serene but uncharacteristically seemed to be removing herself beyond the prayers of people around her. Ordinarily she always gave the greatest heed to the words of the Mahatmas, but now to all prayers for her own recovery, she would smile and say, “There is no kheyala”‘. Sri Jagadguru Sankaracharya of Shringeri, Sarada Peetham, wanted to invite her to Shringeri on the occasion of the Annual Durga Puja and urged that she should get rid of her illness speedily. She replied in her usual gentle tones, “This body has no illness, Pitaji. It is being recalled toward the Unmanifest. Whatever you see happening now is conducive toward that event”. At the moment of bidding him farewell next day (July 2nd) she again reiterated her inability to accede to his wishes, saying “As the Atma, I shall ever abide with you”. Sri Ma, in other ways weaned her devotees from her physical presence. She did not answer letters but the correspondents felt her presence in their hearts and their questions answered. She did not attend any of the functions, which were being performed with the usual circumspection at their proper times in the Ashram. She had stopped taking food for many months. The attending girls could give her a few drops of water only at odd moments. Sri Ma spent her last days at Kishenpur Ashram. She made no farewells apart from saying “Sivaya namah” on the night of the 25th; this mantra is indicative of the final dissolution of worldly bondages. She became Unmanifest on Friday evening of August 27th, 1982 around 8 P.M. Kankhal at the foothill of the Himalayas is holy land. All monastic orders have their Head Quarters at Hardwar. By a consensus of opinion the entire body of the Mahatmas came together to assume charge of Sri Ma’s physical remains. The highest honour was given to her; a procession of thousands escorted the vehicle carrying her body from Dehra Dun to Kankhal. The Mahanirvani Akhadha arranged for the last rites of Samadhi. As Sri Ma had said she did belong to everybody and so everybody participated in bidding farewell to the human body which had sustained their beloved Ma for 86 years. Sri Ma came at a time when India as well as the world passed through many crises. She remained as one of the people, throughout it, imparting hope and solace and upholding the age old ideals of our tradition through overwhelming impacts of alien influences. She fully understood the existential implications of the present age of technology and by her way of being in the world put it in a correct perspective for those who wished to see beyond it. That God is as much present in the world given over to scientific research as in the age of mythology we may say is the “Message” conveyed by her sojourn on earth. We think the soil of Bharatvarsha is holy. Once in a while we see in India, not merely a teacher, or just a saint but an exemplar of the way of life which is the quintessence of her spirit. India cherishes a coming together of heaven and earth, a commingling of the timeless order and the order of time; a meeting of horizons of the eternal yearning in man and the descent of Grace. Once in a while such a dream is realized. We find a Teacher, a Jagadguru, who not only awakens the longing for the quest for Truth but enkindles and sustains faith in its ultimate fulfillment. Click here to see a reading of Sri Ma’s palm in 1937.